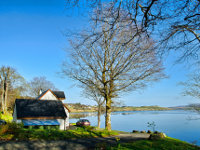 Running through Skeabost (sheltered house), is the River Snizort in which lies St. Columba's Isle (Eilean Chaluim Chille). 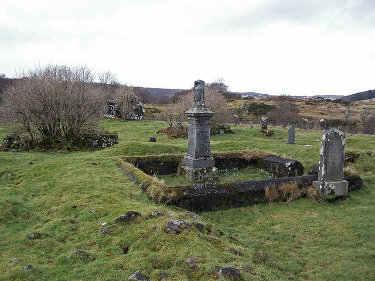 Here lies the ancient burial site and foundations of Old Snizort Parish Church, probably late medieval, which served as a cathedral church of the Bishops of the Isles. 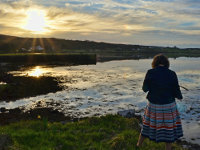 There are also ruins of two small Chapels, their dates associated with the life and work of St. Columba who brought Christianity to The North Isles of Scotland. 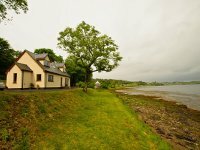 The B&B itself is situated on the shore of Loch Snizort. On occasion otters have been seen swimming up and down the loch, and from time to time seals and leaping salmon have also been sighted. 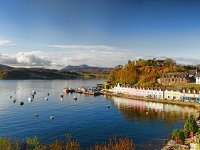 Just a few minutes walk from the B&B is the Skeabost Country House Hotel - complete with a 9 hole golf course, licensed bar and upmarket dining.